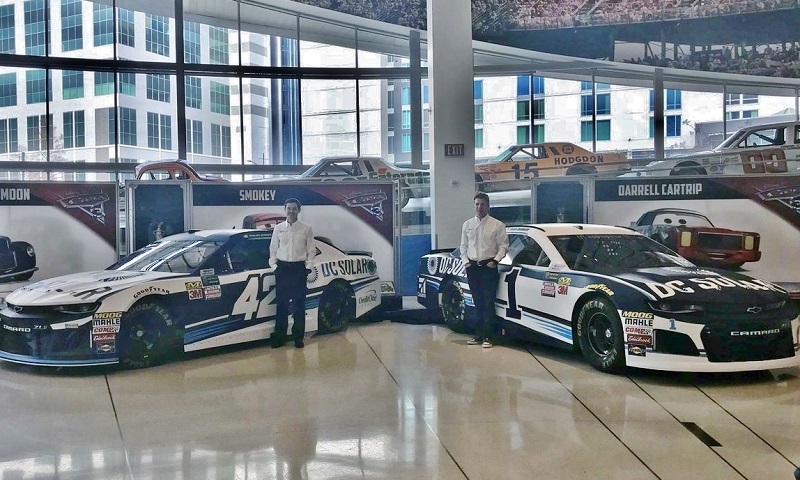 CONCORD, N.C. – After partnering with Chip Ganassi Racing for three seasons in the NASCAR XFINITY Series, DC Solar is moving to the Monster Energy NASCAR Cup Series this year as a primary sponsor of both Kyle Larson and Jamie McMurray. The elevated partnership will kick off during The Clash at Daytona, the season-opening non-points race, where Larson’s No. 42 Chevrolet Camaro will feature DC Solar as the primary partner. DC Solar will then sponsor select races for Larson and McMurray throughout the year. In addition to partnering with Chip Ganassi Racing in the NASCAR Cup Series, DC Solar will continue to be seen in the XFINITY Series for several races on the No. 42 Chevrolet, with both Larson and McMurray behind the wheel. Brennan Poole, who drove the No. 48 Chevrolet for Ganassi the last two years in the XFINITY Series with sponsorship from DC Solar, has not yet announced his plans for 2018. Notably, the partnership with Chip Ganassi Racing will also extend to IndyCar in 2018, where DC Solar will serve as an associate sponsor on both the No. 9 and 10 cars, driven by Scott Dixon and Ed Jones respectively.